This light, tangy dessert has become popular in Paris in recent years. 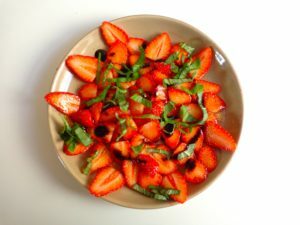 The pungent basil sets off the sweetness of the strawberries, while the balsamic adds a sophisticated touch. Choose locally grown strawberries for maximum flavor. And it’s worth spending a little extra to get a high-quality balsamic vinegar from Modena — the kind that’s thicker than water. The quantities below will serve 2. Rinse the strawberries, slice off the stems and set upright on paper towels to let them dry. Trim or discard any bruised berries. Cut the strawberries lengthwise into 3-4 slices each. Arrange on a serving platter or individual plates. To create a circular pattern as shown in the photo (rosace in French), begin in the middle and work outward. At this point, you can stop and refrigerate the strawberries until ready to serve. Just before serving, sprinkle the sugar over the strawberries. Drizzle with the balsamic vinegar. Snip the basil onto a board and sprinkle over the strawberries. Serves 2.